You see we live in a time where online is so easy and appealing, because it’s quick and easy. And then days happen like recently where both Facebook and Instagram were down for a good part of the day. Not to mention that both of these platforms are becoming exponentially more expensive, competitive and consumers are just getting flogged with so many offers that the responsiveness of these campaigns is becoming more unpredictable. Now don’t get me wrong, I’m not saying you shouldn’t be advertising on Facebook, in fact I’m certain for most it’s still where the largest portion of their fitness marketing budget will go. But…you need to be beyond Facebook. In fact I’d even argue that when you utilize multiple channels well they will all even work better making your cost per lead and marketing ROI dramatically drop. In this video I explain the 5X25 Fitness Marketing Model, simply put we want to be drawing at least 25 leads from 5 different sources each month, so this way if one or more fail our business doesn’t stall. While others freak out that Facebook or whatever is down or not working, you’ll continue to grow and in times where adaptation is needed you’ll be able to take your time and do it right! I seem to hear this a lot late, but this statement couldn’t be more false. Your content isn’t good enough. In the midst of all the day to day hustle, the million things that pull you in, what feels like, thousands of direction it’s hard to make time to generate truly good content. Over these most recent years everything has been about speed, about outsourcing, and there’s some pretty compelling services out there that make it easy to let go of the reins, heck the stuff they provide is often even pretty informative and well written. There’s no soul, no life, character or personality…namely yours. I’m happy to tell you I’ve never send you anything I didn’t write. For a time I used a fair amount of ghost written content for my fitness studios to allow me to focus, but over time I could see the responsiveness of my lists on the decline. Even with you my trainers and fitness professionals, at times where I’ve been overloaded or stressed my content became a little more robotic, less from the heart and truly that just doesn’t fly. In fact it’s probably why you’re saying email marketing for personal trainers doesn’t work! But I’ve got good news, it does, and it will be easier than you think to re-ignite your email list. First if you’re using a pre-generated newsletter, kill it. If you’re using outsources content stop. Start with just once a week and write something from the heart, don’t worry if it’s not earth shattering education, just write from the heart. Your clients, subscribers and team like to hear from YOU, they bought into YOU, so be you. Don’t make it “I” focused, but do express your vision, what you’re excited about, what’s rolling around in that marble of yours on top of your shoulders. Yes, make it relevant to your desired field, just don’t feel like you have to always be a scholar. Recipes are still amazing, but try to focus on ones you’ve actually tried or legitimately want to try. And when sending a recipe my favourite thing to do is send it on Saturday morning, because if you’re like me the weekend affords more time to try something new. So even if you don’t open it, well you know my intentions are clear. Try to do this for a couple of weeks, and now we’ve set the stage to deliver an offer, it’s time for you to watch the video below. In it I outline exactly how I structure my email campaigns. Always 4 emails, always start Sunday (or Monday on a long weekend) at 4 PM, and always written to what I call the 3 personalities. Even if you’ve been in the industry for a while as a personal trainer you expect that when the clock strikes twelve on January 1 that there will be a line up outside your gym like Best Buy on Black Friday! But that’s rarely the case, and as the days tick on, you begin to get a little nervous and wonder what’s going on? Even worse you have more clients cancelling than usual, it’s January, everyone has a fitness New Year’s Resolution, what’s going on? Truth is, it’s like this every year, unless you realize what you’ve missed. January presents a unique consumer psychology that doesn’t exist at any other time of year. Christmas = time off work for most. Time off work = smaller or missed pay. Smaller or missed pay + increased spending = greater price sensitivity. I talk about this weird phenomenon in this weeks video and share with you the fitness marketing strategies to use to overcome it. Facebook Marketing Has Flipped On It’s Head! What a year 2018 has been, I can’t believe it’s already drawing to a close. I hope you are set to take time off and enjoy family for the next few days. Don’t forget to take a deep breath and reflect on all this year has brought, and then gaze ahead to the horizon…what is your biggest goal for 2019? Since it’s the end of the year I’ve been doing a lot of reflecting myself…and a lot of thinking. I always get asked; what do I see happening in the coming year? What will be (if any) the biggest changes in the coming year? Truth is, it’s kind of already happened and you’ve likely felt it. Facebook ads getting disapproved more than ever before, ads initially approved and later shut down. Pushed by Facebook to limit what we show on our landing pages. Our industry thrives on social proof more than many others and we’ve become more and more limited in how we can proudly display our social proof than ever before. This is actually GOOD NEWS! Yup, not a typo, this is good news. Everything comes full circle, and this is no exception. If you’ve been around as long as I have you likely remember what it was like before things like Facebook. Getting new clients was largely referral and B2B based. You had to put yourself out there. It took time to get people to know, like, and trust you before they would commit to buy a premium service like yours. Well, that’s come back around. You see for basically the last 10 years direct response marketers had a heyday on Facebook. We ‘d put up an ad, take people to a landing page then use long form sales copy with fancy headlines, videos, testimonials and before and afters to build the relationship there. The longer we kept them on the page the better chance we had at getting a sale. Now I’m not saying this is completely gone or done, in fact quite the opposite, you’ll still see plenty of this and many of these same strategies will work…only just not like before. In 2019 and beyond you’ll need to be in the groove of building relationships with potential customers on platforms like Facebook through multiple interactions. Only then will you find the Facebook advertising rules will make it easier to show them your landing pages the way you’ve intended. You’ll soon only be showing your ads to highly qualified prospects who know who you are, what you do, and are somewhat actively on the lookout for you. This will make those ad clicks much much cheaper. Your offers and content will become perpetual, which means you won’t need to constantly reinvent the wheel. Your brand recognition will grow as a result, and it’s going to take you less time to market more effectively than ever before. And maybe the best part of all, it’s going to be really, really hard for your competitors to duplicate, see fully and harder still to understand just what your true marketing strategy is. All of this will be accomplished with content cycling and custom audience targets, and I’m excited about it! Well because everything comes full circle, and in 2019 we get to return to what made us great, we can focus more on being the phenomenal educators that trainers are. Our marketing will become a showcase for all the amazing knowledge we gathered around training and nutrition, not just the latest marketing mumbo jumbo! 2019 is going to be a great year, are you ready? If not, you still have time, that’s my Christmas gift to you, this new process is a marathon not a sprint, you start today and your results will steadily increase, your costs will decline and unlike your marketing now each new piece of content will increase your brand and recognition in the community! P.S. In January my coaching clients now get to enjoy our ad setup and management services, meaning if all of the above sounds great but leaves you ever confused well we could just do it for you. J I’m taking on new clients in the New Year, would you like to schedule a consultation? If so reply to this email, I’d love to help you make 2019 your best year in business! Speaking has been one of my most effective personal trainer marketing strategies. And it’s a high converting one, I remember one I used this personal trainer marketing strategy and it brought us more than $11,000 of new sales in just a month, and continued to deliver adding much more for months after. And this will work for you too, in fact, arguably, with a little consistent effort it will work better and be cheaper than anything else that you are doing. What’s more, this is the perfect time of year! 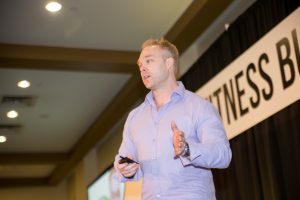 When I got started as a personal trainer there was no Facebook, Instagram or for that matter even having a website as a small company or solopreneur was a big deal. Look I’m only 42 but I’ve literally been in this fitness game as a trainer for 25 years! Here’s how I built my whole business, (and you could to on just this one personal trainer marketing strategy) and it’s so simple at first you may not even believe me, but I’ll lay it all out for you. All the accounting firms in my city. Then I went and introduced myself. I’d simply show up, talk to whoever I could, explain I was a local trainer, yes I was looking for clients but no I wasn’t there to pitch. I’d explain that I knew if I educated people and gave them things they could use today and see and feel a difference (all without leaving the office) that some of them might look me up after. Literally I’d do everything I could to make sure that introduction turned into a 5 minute impromptu fitness evaluation and demonstration for that individual. Hint: A real good understanding of posture and being able to spot deficiencies and explain why and what to do on the spot really helps keep the conversation going. Here’s an example, you walk into office XYZ, you see receptionist sitting at the desk, she stands up to great you. You notice her right shoulder is higher than her left, what might you discern? Maybe she doesn’t use a headset, so maybe she holds the phone against her shoulder a lot. Maybe she carries her purse on that shoulder all the time, or a child/diaper bag. Maybe she sleeps on her side, on that side all the time. Or if it was her left, maybe she has a long commute too and from work each day. Identifying these things and asking, “hey do you sleep on your right side at night?” worked quite often to arouse curiosity and keep the conversation going as I began to explain why I thought that which lead to discussions of headaches, back pain, and what to do about it! You don’t have to be right all the time, and not every conversation will go somewhere. But out of 5-10 I can promise you there’s a big chance you’ll be able to book a lunch presentation or meeting presentation where you get a chance to teach a group. Larger organizations and charities etc that have regular luncheon meetings know very well that by having something education or entertaining on the schedule helps get people focused, inspired and engaged which leads to a more productive meeting. Now you absolutely can’t pitch, but there’s plenty you can do to ensure you get the opportunity to pitch most people in the room; and not just once but repeatedly. First, make sure your presentation is engaging and calls for participation. Not only is it entertaining to watch people try to squat in business attire or high heels, you can turn into David Copperfield deploying things like PNF stretching that will have people who’ve never touched their toes touching their toes in just minutes. Sure this boosts your credibility, but more importantly participation gives you a chance to offer reward. Make sure you have little certificates for your session and the gift card, it doesn’t matter which one they choose as you just planted the seed in everyone’s mind. The point is use your services as rewards for participation because that’s how you’ll get the audience to ask you about them afterwards without ever seeming to pitch. Next…this is the grand finale. Never have handouts, teach them things, stretches, meal planning, etc. Something that will be much easier applied and remembered with a handout, tool, etc. Sure some people will take notes, but here’s what you’re gonna do. Let people know your eco conscious and that’s why you don’t print them, or because everyone is so technology centred these days digital handouts are better because they can be saved in email or on a device and never lost and easy to access any time they’re needed. My aim was always to make sure I left with at least 60% of the participants in the room, if it was less I knew my presentation didn’t connect well enough and that gave me hints as to what to change, what to improve or even what to speak on. It’s not like I was doing these all the time, but I did likely go through periods where I’d have 1-2 of these sessions a month for 3, 4 or 5 months in a row. Needless to say they gave my business a huge boost each time, and it didn’t take long for me to become “the fitness guy” in my city of nearly 100,000. Even in my businesses right now I realize this is a huge gap and missed opportunity for us, in fact that’s one of the reasons I’m writing this for you, because it’s something I know is needed in my businesses and I’m gearing up for more speaking this fall! Like this strategy? You’re a coach, you understand why your clients need you, but often we forget, we need coaches and mentors too. If you’re ready to take your business to a new level, or just looking for the guidance you need to turn the next corner reply, direct message or use the contact form on my website at www.cabelmcelderry.com I don’t know if coaching is right for you but only one way to find out! Consultations are no-obligation of course, I’m just a coach like you doing what I love to do! This week I wanted to share with you how I’ve picked up over 2500+ new Instagram followers in less than 30 days and am now gaining 100+ new followers/day. Now these are not some fake followers or something like that that I’ve bought from shady site or service. These are real people and for the most part all people interested in what I do as an entrepreneurial coach for fitness professionals. In fact in just the last couple weeks I’ve seen a significant increase to optins to my email list and direct messages and email responses from people asking questions and ultimately inquiring about coaching services. I really dislike social media, I’m not someone these days that wants to constantly post and try to cater to the masses. If you have a reasonably large following already (like 10,000+) this isn’t likely for you, the tips below are for people who (like me) have resisted Instagram for too long and realize it’s hurting their business by not establishing an audience. She did this by building an Instagram following of 111 million followers, and then using that to launch her cosmetics line, what’s more is companies now pay her in excess of $500,000 for a single promotional post! Now I’m no Kylie Jenner, in fact I’ve been very resistant to this whole evolving social media but the reality is, like it or not, over the next decade or two as stupid as this sounds it’s going to be a significant class differentiator. Meaning the wealthy and the poor will largely be separated by one thing, the size of their audience; or at least that’s my belief. So I don’t know about you but I definitely don’t want to be on the outside looking in when it comes to this new social economy, whether I’m late to the party or not I intend to make sure I’ve got social capital to leverage in the coming years. The game has really changed, since none of us are early adopters there’s no easy way through all the distraction and noise to catch people’s attention. But here’s the real scoop on how you build an initial fanbase on Instagram. Talk about what you’re thinking about in the description, but keep it easy to read, use extra periods to give you line breaks. No one reads paragraphs or blocks of text anymore, think of each line as a Twitter comment and break it up! Use Hashtags, you can have up to 30 of them on each post and you should try to use all of them! Make this easy on yourself, download the app Hashtagger. You can enter any one hashtag (Like (yourtown)fitness) and it will give you suggestions, you can tick them off, copy and paste and you’re done! (PRO TIP: Paste your hashtags in the first comment of your post, this makes it look cleaner and if you autopost to other platforms (which you should, you’ll notice the option to connect a Twitter and Facebook as you post) it will keep your posts cleaner. Ok if so if you’re an Instagram newbie like me I hope you found this helpful! I’m shooting for 10,000 followers by the end of the year and I encourage you to do the same! Yesterday I was hosting a weekly video coaching call for some of my clients and I was teaching about why people fail when it comes to selling personal training to a group. For the record, I was slow to adopt group selling, to me I always connected best with people one-on-one and felt I’d never be able to connect the same way to a group…which would lead to no one making a decision, me letting them down, and ultimately them not embracing change. In short I was afraid everyone was going to lose. But the thing is, it’s just a matter of understand people and behaviour, and more importantly being a real person. I’ve decided to make my give my wholes sales program away for free for a while in hopes I can help you and who knows maybe you’ll want to talk to me about your business some time. Just head on over to: www.howtosellfitness.net and get instant access right now, totally FREE! You spend marketing dollars right? Does it make you crazy when you spend your hard earned money on marketing and the leads don’t convert? Below are 5 tips you can implement today that will help you convert more leads each and every month, resulting in more money for your business! Go to your public Facebook fan-page right now. Is the “Green Badge” on ? Does it say 100% response rate ? If it doesn’t, it should. What’s the time it takes you to respond ? You should aim for 15 minutes or less. Do you use the Pages Manager app for Facebook ? Do you respond to your Facebook messages and comments within an acceptable amount of time ? What is an acceptable amount of time ? I always ensure to respond to messages as soon as they come in ( unless I’m driving or sleeping ). As a consumer, when I’m researching a new company I’m much more likely to reach out to a business that responds in 1 hour or less than one that takes 24 hours to respond ! This applies to your emails as well. A client question should never go unanswered for more than 1 business day. First question is do you track your leads? If the answer to that question is no, you should enter your name in Cabel’s optin on the front page to get his sales report, or visit www.howtosellfitness.net and get his sales training course; this is the exact training we use to train all of our new managers. If you don’t know how many people are coming through your doors, how do you know how many you’re converting? If you don’t know the names, phone numbers and email addresses of the people coming to check your place out, how will you ever follow up with them? Once you’re tracking all the leads that come to you through your various marketing channels the fun begins. You start texting, calling, emailing every couple of days. I know what you’re thinking ” Won’t that get annoying to my prospective clients? ” the short answer to that is YES! That’s not a bad thing though. It shows them that you care. How often do you see an email or a text and think I’ll answer that later, and never answer it? That’s what’s happening to your leads. They want to make a change, but it’s not a priority yet. You have to be in the front of their mind all the time, and then one day a switch will go off. If you hadn’t reached out to them as often as you did, they may have never walked through your doors. If you’re in this industry I already know that you want to change lives. You want to help people. But how do you show them that you genuinely care about them? First step is to take an interest in them. Make a little note of it in a book somewhere and remember to ask them about it. I don’t know about you but when I go to a new hair dresser and then go back 8 or 12 weeks later and they remember details about me, I’m sold. I’m coming back time and time again. It feels good. Can you think of a time that it meant a lot to you when a business remembered details about you? Come to work with a smile on your face every day. Celebrate victories and goals with your clients with photos or have a client of the week board. Show the people you care and they’ll continuously return. Find a way to get on their level. You’re the expert now, but you weren’t always that way. Share a quick personal story with your leads or on your social media channels to show people that you’re human too. Be real. Do you have a weight loss story? Share it! Have you ever struggled to gain weight? Share that story! Have you lost a family member to obesity related disease? Share your why. Share with your clients why you’re passionate about what you do. This kind of encompasses all the other points. Be you. Be passionate. Be caring. Be transparent. Be kind. Be honest. Be real. People want to trust the people they do business with, and the only way to have peoples trust is to earn it. How would you start a successful fitness business if you were just starting over. Not how I would start one today with all the resources now at my disposal, but to rewind the clock and with all the knowledge (from all the painful mistakes I’ve made) how would I start out today (currently 2017) with limited resources? The good news is, it’s cheaper and easier than ever. You have so much direct control over things that we never used to have, you can control expenses better than ever before and new customers are just a few clicks away! In this video I share with your some of my thoughts of exactly how I would do it, I hope this gives you some direction. What do you think? Did this video give you some ideas? One of the things I’ve found is; that it’s easy to keep gathering information, it can be a pretty scary thing to actually go out and do it. Something that seemed so simple suddenly becomes scary, or a lot more complicated. Our industry is built on the fact that as people, as human beings, we need each other; we need support, community, confidence and accountability. I love helping people, I love helping fitness professionals help more people, maybe I can help you. From time to time I take on a few private coaching clients, if after watching the video above, if you’re serious about taking big action in your business maybe I can help you. Quite often I help fitness pros add $5000, 10,000, $15,000 a month in additional revenue in 60-90 days. If you’d like to know more about private coaching send me a message here. Competition is fierce these days, having a strong point of differentiation is continually growing to be more difficult. Our approach is simple, help our clients develop such strong relationships not only with us but with one another that they never want to leave!